The rock cycle is a concept of geology that describes the transition of rocks between the three rock types: igneous, sedimentary, and metamorphic. The cycle outlines how each rock type can be converted to another rock type through geologic processes. Most of us think of rocks as objects which don’t change. We perceive that rocks just continue to exist as is, or at least we treat them as if they do. Yet the truth is that on a geological scale, a scale of millions of years, nothing is unchanging. The rocks and the soil around us are the products of millions of years of transformation due to a variety of different geological processes. 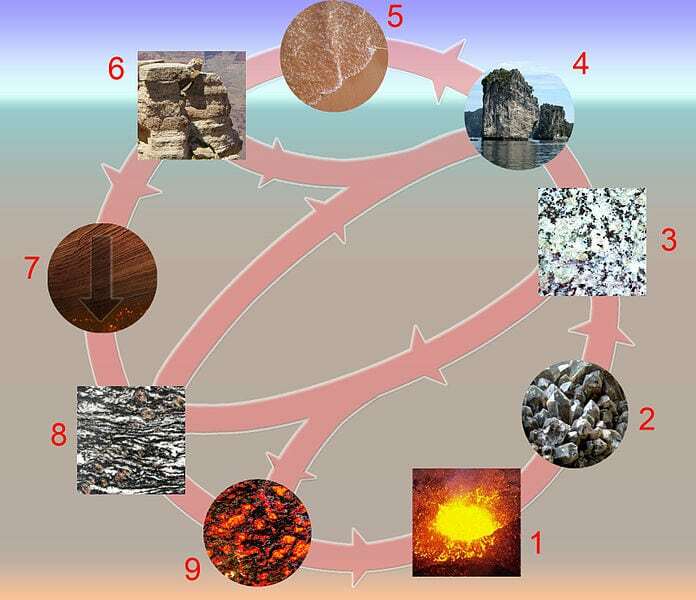 These geological processes can be referred to as the “rock cycle”. The discovery or description of the rock cycle is usually credited to James Hutton, a geologist who lived during the 18th century. Hutton is sometimes referred to as “the father of modern geology”. Hutton noted that the process had “no vestige of a beginning and no prospect of an end.” He had realized it was a process that had been going on since the formation of the Earth, and that the cycle moves rocks, melts them, and transforms them endlessly. Similar to the process of recycling, rocks move through a cyclical process. This process can take rocks from being magma to being on the surface and experiencing erosion then back to being magma. The rock cycle can produce and transform three different types of rocks: sedimentary rock, igneous rock, and metamorphic rock. How are the three different types of rock classified, and how do they transform into each other? In essence, geological processes can transform one type of rock into another. Igneous rocks can be transformed into either metamorphic rocks or sedimentary rocks, while sedimentary rocks can transform into both metamorphic and igneous rocks. Naturally, metamorphic rocks can transform into sedimentary or igneous rocks. Before we dive into the processes which transform the three different rock types into one another, it would be helpful to define some terms. Metamorphic rocks are created by intense heat and pressure. The pressure and/or heat is so intense that it can transform the basic properties of another type of rock. Typically tectonic processes (the processes responsible for the moving of the continents) create metamorphic rocks, but they can also be created through smaller scale collisions and pressure situations. Note that while either/both high pressure or high-temperature processes can create metamorphic rocks, one force can be dominant in the creation of them. The temperature level must also be within a certain range as if the temperature becomes too high, igneous rocks will be made instead. There’s two different types of metamorphic rock, foliated metamorphic and non-foliated metamorphic. Foliated metamorphic rock includes rock like schist and slate, which have prominent bands on them thanks to their exposure to high amounts of heat and pressure. Non-foliated rocks don’t have bands and include things like marble and quartzite. Igneous rocks are made through high temperatures, hot enough to melt rocks and turn them into magma. The cooling and solidification of magma that happens over time creates igneous rocks. Magma starts off very hot below the surface of the Earth, but as it is pushed towards the surface it begins to cool. Rapid cooling of magma can lead to rock formations with tiny crystals in them, while slower cooling can lead to large crystals. The most extreme form of rapid cooling is a volcanic eruption. In the case of a volcanic eruption, the magma is spewed directly into the air, and this means that the magma has a chance of bypassing the rock stage entirely and transforming into volcanic glass. Igneous rocks are subdivided into two different categories, intrusive and extrusive. Intrusive igneous rocks are those which slowly cool beneath the surface, and include granite and peridotite. Extrusive igneous rock refers to those rocks which are shot out onto the Earth’s surface due to a volcanic eruption, and these include obsidian (a form of volcanic glass), basalt and pumice. Sedimentary rocks are created through the process of sediment deposit and consolidation. Sediment is any type of geological particles, particles made out of Earth, that are small enough to be carried off and moved around by wind or water. These particles can build up in an area over time, such as at the bottom of a river. After the particles build up they can join together and harden into a single sedimentary rock. Though both igneous and metamorphic rocks are created beneath the surface of the Earth, sedimentary rocks can be created while buried under a relatively small amount of soil, or even while on the surface. Sedimentary rocks come in three different types: clastic, chemical and organic. Clastic sedimentary rocks include shale and sandstone and are usually formed by weathering, while chemical sedimentary rocks form from chemical precipitate and include rock salt and flint. Finally, organic sedimentary rocks include dolomite and coal and they are formed by the accumulation of organic debris like dead leaves or animals. As hinted at above, the transition between rock types can happen due to a variety of processes. Metamorphic and sedimentary rocks can become igneous rocks by being turned into magma at high temperatures, which usually takes millions of years to happen. Metamorphic rocks are created through temperature and pressure, as long as the temperature isn’t too high. Metamorphic rocks can be created through either contact metamorphism or regional metamorphism. Regional metamorphism happens as geological regions smash together, like at mountain ranges, which creates foliated metamorphic rocks. Contact metamorphism happens when rocks come close to hot igneous rocks, which ends up altering the properties of the rock and creates crystals. Finally, surface processes like precipitation and weathering can transform metamorphic and igneous rocks into sedimentary rocks. The primary forces behind the rock cycle are geological. These forces are subduction and uplifting. Uplifting refers to the pushing of rock out of the Earth’s surface, creating mountains. 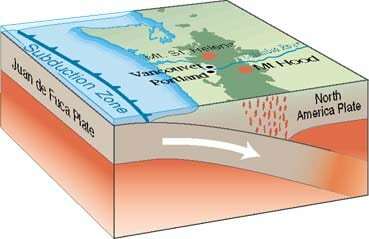 Subduction is when one rock plate submerges beneath another plate and becomes magma deep underneath the Earth. Both subduction and uplifting are caused by plate tectonics. The continental plates which lie on the Earth’s mantle are moving. While the plates usually only move at a few centimeters a year, over millions of years this leads to massive changes in the Earth’s surface. As these plates collide and slip past one another, certain regions collide and are pushed up while other regions are pushed below. The phenomenon of seafloor spreading also plays a role in the rock cycle. The tectonic plates which collide with each other are by necessity pulling away from each other in other areas. 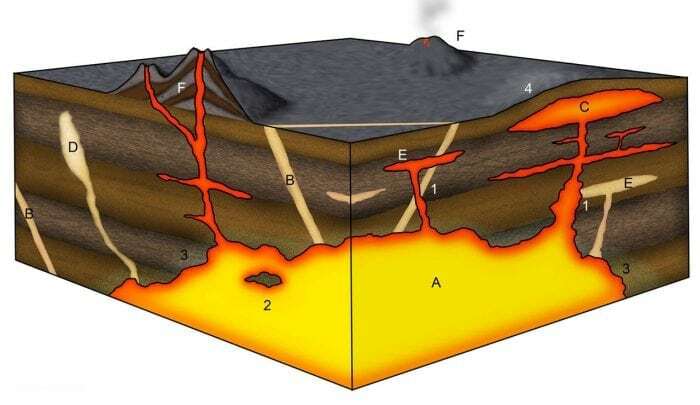 This means that magma is released from the Earth where the plates are dividing, deep in the ocean. This phenomenon leads to the creation of more seafloor along with metamorphic rocks and igneous rocks. Surface processes like weathering also contribute to the rock cycle. Wind and rain can wear away and rocks over time, breaking apart igneous and metamorphic rock structures into small particles which then join together to create sedimentary rocks. Our world’s geology is driven by processes which have been going on since the formation of the Earth. Every rock you see, from the smooth stones in the riverbed to the mountains in the distance, are part of the ongoing cycle.